On Feb 26, 2010, as part of their first response to Climategate, Thomas Stocker, a Climategate correspondent of Phil Jones and by then Co-Chair of AR5 WG1, sent a still secret letter to all AR4 Lead Authors, Coordinating Lead Authors and Review Editors under the letterhead of WG1, purporting, it seems, to represent the parent IPCC organization. The existence of this secret email came to light as a result of David Holland’s persistence in trying to cut through IPCC authoritarianism and secrecy. After learning of its existence, David submitted an FOI request, which has been refused, and which is now under appeal at the Tribunal. you asked for input from the IPCC AR5 WGI TSU to help you prepare answers to some questions raised in the context of the Muir Russell enquiry. Attached please find the response which has been prepared in consultation with the former Co-Chair and TSU of WGI for the AR4. On March 30, UEA provided a partial response, including a letter of May 13, 2010 from Briffa to IPCC AR4 Coordinating Lead Author Overpeck soliciting a testimonial to the Muir Ryssell panel and Overpeck’s response of the same day. It also included a cover email from Stocker (dba IPCC WG1) to IPCC AR4 Lead AUthors dated Feb 26, 2010 – just within the time frame of Holland’s request. Note that this was to AR4 Lead Authors not AR5 Lead Authors. As typical, UEA did not include the attachment. Holland is used such tricks (TM- climate science) from UEA and submitted another request in May 2011, this time for the attachment to the Feb 26, 2010 email, containing the actual message from Stocker to AR4 Lead Authors. there would be an adverse effect on international relations between IPCC WG1 and academic institutions within the United Kingdom because it would force is to reconsider our working arrangements with those experts who have been selected for an active role in WG1 AR5 from your institution and others in the UK”. Although Stocker sent this letter on IPCC letterhead, it is not clear (and appears highly unlikely) that he had obtained any sanction from IPCC for this letter and appears that he was acting on his own authority. UEA refused Holland’s request the same day. Holland asked for an internal appeal. UEA duly sent another notice letter to Stocker, who sent a virtually identical haughty refusal. UEA refused the internal appeal. we would also object to their being identified by your revealing their position within the WG1 TSU as is now requested. This amounts to the same thing as revealing their name because each staff member has a specific job title. This quotes from Stocker’s letter. Note that IPCC headquarters are in Geneva, a more senior provenance, while the actual letter came only from the IPCC WG1 TSU based in Bern. The distinction between IPCC – an intergovernmental organization – and WG1, a volunteer group of scientists, is an important one, that was elided in UEA’s submission ( the distinction was caught by Richard Tol in comments at Bishop Hill). On March 1, 2012 (FER0408711), the ICO decided against David Holland as well. Holland appealed to the Tribunal on March 27 (EA-2012-0070). The matter is pending. Thus, despite Climategate email 3529.txt (also attached) in which Dr Solomon told the UEA’s Professor Jones that she did not speak on behalf of the IPCC; and despite Climategate email 4752.txt (also attached) from Professor Jones to Mr David Palmer at the UEA stating that the Working Group Co-Chairs do not speak for the IPCC, the UEA appear to have persuaded the Information Commissioner that they do. For the benefit of the Tribunal, I should be grateful if, as the Secretary of the Intergovernmental Panel on Climate Change, you can confirm or deny that the attached communications from Professor Stocker to the UEA, represented by the UEA as the official view of the Panel and accepted as such by the Commissioner, are indeed the official view of the Panel of government representatives as agreed by them. Can you confirm or deny that it is the official view of the Intergovernmental Panel on Climate Change that the withheld information referred to by Professor Stocker and the UEA should not be disclosed? 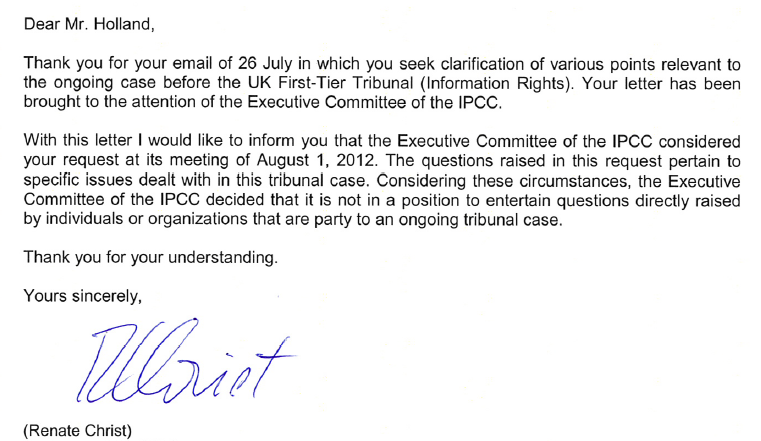 The IPCC refused to confirm or deny on the basis that the matter was pending before the Tribunal. But the entire issue was whether Stocker had the authority to represent IPCC views. I’m at an IPCC meeting this week. IPCC has rules and regulations, which we’ve sent you in the past. Tim can resend these if you don’t have them. I have spoken to someone here. IPCC is only a small bureau in Geneva, and the various people who lead the Working Groups don’t get to talk for IPCC. This did not stop UEA FOI officials from representing letters from Jones’ pal, Stocker, as official IPCC positions. Postscript 1 Remember the IAC report – the one which recommended that the IPCC Executive Committee include independent directors. Stocker and others sabotaged that. Instead, they appointed the Co-Chairs of the Working Groups to the Executive Committee: Stocker, Christopher Field from WG2, Ottmar Edenhofer of WG3. The full chain is this. The Committee quoted from the submission of Universities UK, which quoted from the ICO decision in my case (under appeal to the Tribunal.) The ICO quoted from a UEA submission in my case. Even though it was cited in the decision, the ICO refused to provide the submission to me even in response to an FOI request. The UEA in turn quoted from Stocker’s letter objecting to disclosure of his still secret letter to AR4 Lead Authors. I wonder what Stocker’s secret letter said. And while Stocker framed his objection in terms of UK FOI legislation, the letter went to all AR4 Lead Authors, many of whom work for US, Canadian and Australian federal agencies and universities, offering other possible routes for obtaining the letter if IPCC wants to do things the hard way. This entry was written by Stephen McIntyre, posted on Aug 3, 2012 at 12:52 PM, filed under FOIA, IPCC, Uncategorized and tagged edenhofer, stocker. Bookmark the permalink. Follow any comments here with the RSS feed for this post. Both comments and trackbacks are currently closed. If this plot was any thicker, it would be gelatin. Tine again an amazing amount of effort goes to throwing up smoke screens and ducking/diving rather the exposing the ‘settled data ‘ for all to see which in the is only why of getting the changes they say are needed and can’t come to soon . This post is about somebody from the University of Bern, the last post was about a group with somebody (else) from the University of Bern, so how about another, third post about the University of Bern giving a price (and money) to Michael Mann for his scientific achievemnents? p.s. Raphael Neukom of Gergis et al (2012) significance also came out of Univ. of Bern recently finishing his doctorate there (2010). Small world…. involved recently. I haven’t been for a few years. Phil Jones was also an Oeschger medal awardee back in 2002. Re Bern in Switzerland, after a visit there we wrote a letter to the Mayor protesting about a smallish pit in which a couple of bears were kept with an old log and a rubber tire. It was like animal death row, with nothing but boredom forecast until termination. The Mayor did respond, but in a dialect of German that even very German friends had trouble reading. He avoided a straight answer. I don’t know how to tie this together, with images of digging holes, beasts doing what they were forced to do, publicity attractions, data hard to access, a tree to study endlessly. I suppose the Mayor will get a medal if the qualifications are similar. The Bernese speak Bernese German, and no doubt that colours their written German at times, especially when they don’t want to answer the question. Dulles was also able to use his influence to have the street lights outside the property turned off to assist the secrecy of his visitors. These welcomed guests included spies, traitors, refugees, priests, exiles and expatriates, anyone who could provide him with intelligence. One of the most distinguished visitors to the apartment was Prince Max Egon zu Hohenlohe-Langenburg, a special agent of Himmler. Ah yes, those cosy moments between Dulles and Himmler. The Wall Street lawyer of course had the highest motives in all he did, whether in business or what is called government service, and I wouldn’t wish to suggest otherwise – but only because it would take us way off topic. I’ve been told that IPCC is above national FOI Acts. One way to cover yourself and all those working in AR5 would be to delete all emails at the end of the process. Hard to do, as not everybody will remember to do it. Phil still doesn’t seem to get the concept that there’s no such thing as deleted emails. Open letter to all scientists who recieved the letter in question. Would one of you please send a copy of the letter to Mr. McIntyre. If there is nothing incriminating in the letter then there is no harm done and this situation is quickly put to rest. If there is then sending the letter demonstrates that you are a man/woman of character and integrity. Of course not sending it implies the opposite. Thank you in advance for doing what is right. This deserves more than facile retort! Do you mean February 2012? To me this is very strange. Just from a point of principle if you asked for “snail mail” that included a cover letter for some documents, you wouldn’t expect to just receive the cover letter. The only reason you view them as seperate is largely to how the UI presents it, and that is largley for security concerns, in that the email client won’t open non-text parts automatically. IANAL but only releasing the first section (upto the first – in practice the second – divider) of a multi-part mime email is probably non-complaint under law? What is it? Don’t ask. h/t to David Bader and David Holland. Indeed, if everyone held their cards above the cloth and dealt from the top of the deck, there would be not controversy. In the post that you wrote and have linked in your comment, you have slandered Steve by accusing him of being paid to operate his blog for the purpose of undermining public confidence in the work of climate scientists. I would suggest that you either provide proof of this fact or apologize for defaming his character. IMO, your sleazy attempts at character assassination would merit a ban on spreading your venom here. 2. Keep it nice. If you were invited to a dinner party, you wouldn’t insult the host or other guests. This is my dinner party. His rule number two. Since it is his blog — mighta thought he would notice. Thanks, Uknow. A great example of propaganda 101 at your link. All he does is show what little sense he has muchless what he speaks. People like him are their own worst enemies and a great example for “neutrals” of the AGW apostles. Taking their lead from the UK Government here. Transparency? Yup but not as we see it Jim! Oh, somebody please get him to vow to cut off American scientists too. Very convoluted but at the heart it sounds like the 3 Wise Monkeys are at play. If certain truths are revealed we will need to act; solution: hide the truths! Anyone still want to argue these guys aren’t playing politics? What a tangle of self interest. It would seem that a legal challenge may be fruitful. I bet you could find the funding to unravel this onion of cross pointing fingers and get to the core question. At some point an adult has to enter the fray with legal swag. No more jollis to Bali for you if you can’t effectively stonewall people who question us. Some of these are not institutions subject to FOI laws in their respective countries. Please look up their mailing addresses on your own. Richard Somerville (USA), University of California, San Diego. Steve: this list is incomplete. Jones and Trenberth, for example, were CLAs. Christoph Heinze, University of Bergen, said to represent both Norway and Germany. Eystein Jansen from Bjerknessenteret, University of Bergen was Coordinating Lead Author of WG1 Ch. 6 on Palaeoclimate. How many of these are member of WWF or other like WWF? Putting aside your assertions for now – you highlight their mindset. And problem. Its not a game. If CAGW is such important a question for all of mankind – isn’t it a reasonable thing to expect people to behave ethically and above all else – to put their data and code out there so that others can check and make sure that we’re sure about this? Why expend such a collosal amount of time and energy hiding this stuff? LearDog, I think the problem is the perceived mythical well-funded all-distorting oil-powered disinformation campaign they believe they face as an enemy – something akin to a cross between George W. Bush and Saddam Hussein I imagine – and which justifies their secrecy and charades. After all, anything the enemy learns will be used by him only to distort, or so they believe. H/T to Berényi Péter ! Here in Ottawa, Canada, I have written to my Member of Parliament, David McGuinty, asking him to find out whether there are any Canadian government employees who are in receipt of the secret letter. If there are, I have asked him to demand that they reveal the contents of the letter immediately. I am not holding my breath. Why, let Mr. David McGuinty know Dr. Kenneth L. Denman was a Coordinating Lead Author of Chapter 7 of the Intergovernmental Panel on Climate Change (IPCC) WG1 AR4 titled “Couplings between changes in the climate system and biogeochemistry”, and as such, was certainly among the recipients of said secret mail. He is a Senior Scientist with Fisheries and Oceans Canada (DFO), which, in spite of its cryptic name, is a Ministry branch, really. And they have a rather strict transparency code. 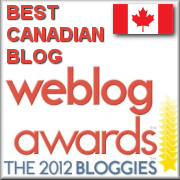 Do we know any other Canadians who might email a query to either Mr. Mcguinty or Dr. Denman ? Re: R.S.Brown (Aug 5 00:54), David McGuinty is dedicated to the cause of Green Energy and believes deeply that cAGW is the greatest threat to mankind. It is unlikely that he will be sympathetic to your request. Then the request should be redirected through an MP who is not beholden to the CAGW “cause”. How about going getting right down to brass tacks and ask the Honourable Peter Kent, Federal Minister of the Environment and Member of Parliament [C] for the riding of Thornhill, Ontario? Anyone on this blog from that riding? David McGuinty is in favour of ‘moving to a carbon free economy’ when last I saw him on CBC TV ( a few days ago in fact on Power & Politics ). His knowledge of science is somewhat limited. This is the simple explanation: No one can be in WG1 whose communications are subject to UK’s FOI, if this letter is released. Must be a doozy of a letter! Why the moderation on my tetris suggestion? Someone of voting age in Canada [preferably from the Thornhill riding] just ask Peter Kent to get us the answer. Right guy to ask and shouldn’t altogether be too difficult to do..
@ the Bish’s, hottin’ up this one. The letter has turned up. A copy is at WUWT. I felt that the bit about how they had already decided what the answer is, and that the purpose of AR5 is merely to make the message more effective, was something that I wouldn’t want to spread if I was trying to pretend to be a scientist. The rest is very bland. They may claim that only means that their work is an ongoing project, but it certainly does imply that AR5 is not any genuine new re-assessment. AR5 is simply a pre-ordained confirmation of AR4’s findings. Not too surprising the IPCC types look at it this way, but not a genuine critical and scientific spirit…. also, the admissions that it was a problem to rely upon “grey” literature in the past, and that some govts may have been considering their own inquiries or pressing the IPCC to do something (back in 2009-10) may be embarrassing admissions, however inconsequential they proved in terms of any critical outside attention….